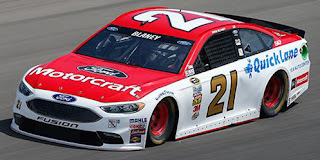 Hopes were high that Michigan would be the site of Ryan Blaney’s breakthrough win for the Wood Brothers, their first at the track since Dale Jarrett’s maiden victory in 1991, but NASCAR’s new low-downforce aero package proved a handful. Blaney timed in 5th, ran 4th in Saturday’s opening practice, and was never ranked worse than 14th for most of the weekend. He made several daring passes on Sunday and was still inside the Top 10 when he found the outside wall on Lap 163. In the first of two separate incidents, Blaney was shoved into the outside lane in Turn 2 and slapped the fence, followed behind by a tangle between Jimmie Johnson and Trevor Bayne. Blaney fell outside the Top 20 on the restart, but made his way back inside by the checkered flag. In two weeks, Blaney is set to make his first Cup start on the road course in Sonoma, California for the Toyota / Save Mart 350. The Wood Brothers have not competed on the track since 2008, but when they did, Marcos Ambrose had a stellar run going in his Cup debut. Ambrose started 7th in the #21 Littel Debbie Honey Buns Ford and ran in the Top 5 for much of the afternoon, but after a late spin from contact by Elliott Sadler in Turn 7 broke the tranmission and finished a disappointing 42nd. Premium Motorsports brought two identical black Chevrolets to Michigan for Cole Whitt and Reed Sorenson, who would again run each other’s rides as they did last week at Pocono. However, by Sunday, Whitt’s #55 again bore the white-and-purple scheme for Vydox Plus Extra Strength. Whitt started in the Bottom Five, for spots ahead of Sorenson, and once again fought hard to stay on the lead lap. He didn’t get passed until Lap 28, when he was running 34th, 6.9 seconds behind 33rd-place Regan Smith. Persistence paid off in the end, and Whitt earned the Lucky Dog under the Lap 156 caution for the wreck between Brian Scott, Danica Patrick, and Casey Mears. Whitt defended his lead-lap position all the way to the finish, marking just the fourth time in 2016 either of the Premium Motorsports cars finished on the lead lap (the most recent being a team sweep at Talladega with Whitt and Michael Waltrip). Wise joined the fellow Open drivers Whitt and Sorenson in the Bottom Five at Sunday’s green flag and was also buoyed by the early-race attrition for his second-best finish of the year and fourth-straight finish under power. Around Lap 18,Wise slid up the track and fell behind Michael Annett for 39th, then was lapped two circuits later. Unlike Annett, who would go on to earn the final two Lucky Dogs of the afternoon, Wise fell short of becoming the first car one lap down and ended up three down at the finish, another three laps ahead of 31st-place Reed Sorenson. The next Sprint Cup Series round at Sonoma will see The Motorsports Group attempt the race for the first time. The #30 hasn’t run at the track since 2013, when David Stremme came home 36th for the now-defunct Swan Racing (formerly Inception Motorsports). Wise, however, is no stranger to the road course. He made his first full-race run for Front Row Motorsports there in 2012, saving his #26 MDS Transport Ford from an off-course excursion in Turn 10. The last two years, Wise ran the Dogecoin Digital Currency Chevrolet for Phil Parsons Racing. The 2015 running saw his white #98 come home 28th, the driver’s career-best. Sorenson again seemed an early favorite for LASTCAR’s Michigan feature. His black #98 Chevrolet was the first to lose a lap on the 17th circuit, and he’d lose two more through the first round of green-flag pit stops. Though he came home six laps behind race winner Joey Logano, he managed to keep his nose clean among the sliding cars, earning his second-best finish of 2016 (the best being last Sunday’s 28th-place run at Pocono). Among the cars in Sorenson’s rear veiw mirror were 39th-place Dale Earnhardt, Jr. and last-place finisher Kyle Busch. Sorenson has four career Cup starts at Sonoma, but none since his 32nd-place run for Tommy Baldwin Racing in 2014. His three previous starts in 2006, 2007, and 2009 came in Dodges for Chip Ganassi Racing and Richard Petty Motorsports, respectively. Sorenson’s best run came in his track debut as a rookie, when he ran 29th in his only lead-lap finish.